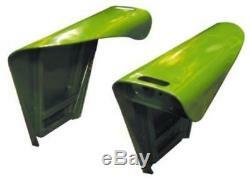 Two (2) New Aftermarket Replacement Restoration Quality Fenders (Left & Right Hand Side) made for John Deere T ractor models: 2010, 2030, 2150, 2155, 2350, 2355, 2440, 2510, 2520, 2550, 2555, 2630, 2640, 2750, 2755, 2840, 2940, 2950, 2955, 3010, 3020, 4000, 4010, 4020, and 4320. PLEASE NOTE: These will NOT fit on 2 Cyl Tractors. They will fit on 10 & 20 Series ONLY. Comes with Grab Holes and Rubber Grommet for Hole. Also need Fender Mounting Casting. Restoration Quality, Made in the USA. Sale Depends on Stock at the Time. Only the 48 contiguous States in the U. (Left Side): RE13879, AR48873, AR20870R , (Right Side): RE13878, AR48872. 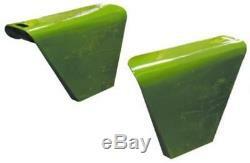 The item "Two (2) Left & Right Side Fenders for John Deere 2010 2030 2150 2155 2350 2355" is in sale since Friday, November 04, 2011. This item is in the category "Business & Industrial\Heavy Equipment Parts & Accs\Antique & Vintage Equip Parts". The seller is "stevenslake" and is located in Williamston, Michigan.